When the United States entered World War II, the Navy was faced for the first time with the problem of landing and supplying large forces where conventional harbor facilities were occupied by the enemy. Naval officers conversant with invasion landing problems foresaw that many problems could be solved with assemblies of pontoon strings and conceived that they might be used for wharves, docks, piers, lighters, tugs, and special-duty barges. The importance of the contribution to the war effort made by the Seabees and their pontoons cannot be overemphasized. During World War II, PHIBCBs were designated Naval Construction Battalions, Pontoon, and were generally called Pontoon Operating Battalions. Pontoon-barge-mounted 75-ton booms unloaded PT boats from carriers under the noses of the Japanese in the Solomons. Pontoon-floating drydocks serviced damaged small craft in many parts of the world. Barge-mounted cranes deepened harbors, and loaded and unloaded vessels. In the campaigns of Sicily, Normandy, Italy, and the Philippines, causeways were indispensable in the rapid unloading of vehicle-borne cargo from LSTs. Rhino and smaller barges ferried cargo ashore, and pontoon tugs retrieved broached craft from the beaches, helped tow barges, and assisted in the installation of piers and wharves. All over the world, pontoon piers, wharves, and bridge units were used to create harbors or to increase the facilities of existing ones. It was learned during the invasion of Sicily that pontoon causeways provided an excellent method of rapidly unloading vehicle-borne cargo from LSTs. The shallow water of the southern beaches of Sicily effectively prevented LSTs from moving in close enough to shore to discharge troops and cargo. Consequently, the enemy made preparations for an assault from the North where the water was deeper. By using causeways between LSTs and the shore, allied troops and cargo were landed on the southern beaches and achieved the element of surprise. Detail of pontoon secured to side of the ship (Morris Smith, LST 887, 54-55). Pontoon dropped. (Morris Smith, LST 887, 54-55). Pontoon being retrieved. (Morris Smith, LST 887, 54-55). 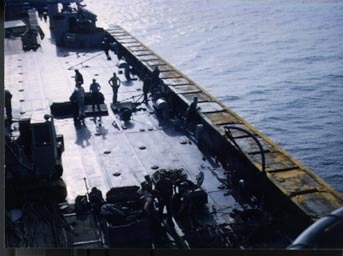 Pontoon stowed for sea (LST 887 website). 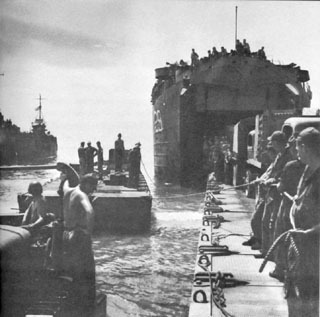 Pontoon used to unload vehicles from LST. (NFESC home page, see address below).